Maybe it’s the fact that I’m stepping away from business for a few months, or maybe it’s just the season of life I’m in, but I’ve been into the topic of entrepreneurship for the past few months. Mostly via podcast, per usual, but also through books, local groups, and websites too. Here are a few of my favorites. Fired Up & Focused. I think I blogged about this book (and program!) before after hearing Rachael speak last year, but I recently re-read it with a new mindset. It was great and gave me so many ideas for my own business. I love how Rachael’s focus is working smarter not harder, and she really nails down efficiency. It’s something I’m always working on. Because don’t we all want that ideal work-life balance? She gets it, and this book has some great actionable tips. I’ve written about Brooke Castillo a hundred times. Her podcast is great for the everyday person when she talks about life topics, but she’s also a life coach to many life coaches, which is why her podcast is called The Life Coach School podcast. I recently cherry picked some of her more business-y topics to listen to, and episode #186: How to Make 100k was one of my favorites. While I am not specifically a life coach with that kind of business, I loved hearing the stories of the coaches she interviewed and their paths to success. Those of you interested in this topic might also like episode #16: 100k as a Life Coach? as well. Along the same lines, I have started listening to Allie Casazza’s podcast – The Purpose Show. Her podcasts are to-the-point with lots of great tips. On the entrepreneur front, I really enjoyed hearing her back story to how her business went viral (episode #6), which isn’t the normal in the digital world. I also really enjoyed hearing Allie share her schedule (episode #30), the balance between kids and work, and other tidbits about being a business woman. I think I heard right when she said her business brings in SEVEN figures (that’s over a million dollars – I had to literally count zeros to make sure I was hearing right), so she is one badass entrepreneur! And lastly, episode #72 when she did a ‘things I’m afraid to tell you’ style show was great. I could have given the same introduction about just trying to be real but feeling like I live in a fishbowl at times. It was a great listen! I was recently introduced to Basis as a modern online approach to mental health. As entrepreneurs (and parents and students and new moms and humans), it’s easy to get overwhelmed with life. While more serious scenarios might require therapy or specialized medical professionals, Basis is there when you just want to talk to someone. We work-from-homers sometimes just need some extra support! For just $35 a session (a 45-minute video call), you meet with a trained specialist well-versed in research-backed approaches to talk you through your struggles and give you an actionable plan. Appointments can be made the same day you reach out, and there is no membership or commitment required. Specialists cover topics like work, social, school, finances, relationships, parenting or balancing all of the above. I scheduled a call with a Basis Specialist to try the service out for this post. My topic: parenting! You hear so many different approaches out there to dealing with school-aged kid attitude, chores, screen time, and routines that it was great for me to sort through our specific situation and come up with a plan for Mazen. Since we’ve cut our screen time down to zero during the school week, one strategy we came up with that I loved was to make a visual poster of activity options Mazen can do when he’s bored – alone, with me, or with the neighbors – to give him some ideas. We also ended up talking a lot about work-mom balance when the new baby comes. For new moms who might be feeling lonely or overwhelmed, Basis couldn’t be more mom-friendly since you don’t have to leave your house. If you’d like to give it a try, you can use the code KATH222 for $20 off! Locally, I’m in a Charlottesville Boss Babes group, which has been great for networking both on Facebook and at the monthly meetings (which sadly I have only be able to attend once – working on it!) The group has enabled me to meet up for coffee with a few other bloggers. (Shout out to Will Frolic For Food and Brooklyn Supper!) Thanks to the group’s leaders, Linea and Jess, for their hard work keeping the group going. Last year I attended the Rebelle Conference in Richmond, which was a wonderful way to network and learn from other women in business in Virginia. Its theme “Lifestyle design for entrepreneurial women” was right up my alley. If you have these kind of groups or events in your cities, it can be scary to go to at first (even for an extravert like me!) but I have found I am always so glad I’ve gone! I’m going to miss this year’s conference due to Baby B’s arrival, but I can hopefully attend again in the future. And with that, I’m off to a working breakfast! The marketing of things like “boss babes” and “girl bosses” feels sexist to me, not to mention silly. I doubt Sheryl Sandburg identifies as a #bossbabe! I’m all for empowering women but it shouldn’t be patronizing. I know people have strong opinions about it. I learned my lesson the one time I used it and you guys all got mad! But that’s the name of the group, so I’m simply sharing the name. Perhaps when you’ve invested more time in the group, you’ll feel like a stakeholder who can explore why these successful entrepreneurs who are also women wanted to name their group something that, for many women, has a cutesy, patronizing connotation. 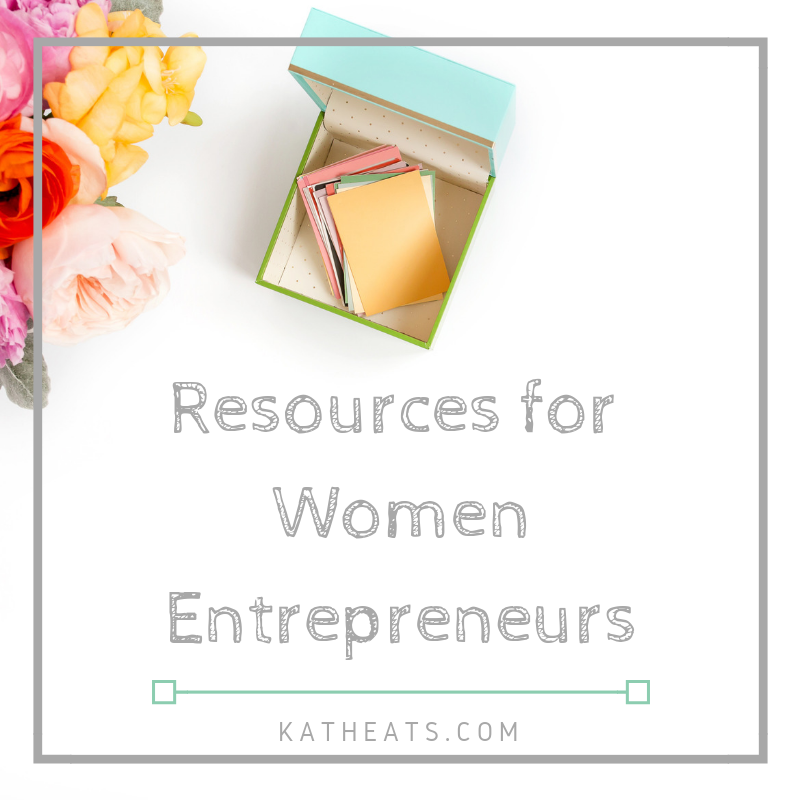 No one is attacking you or women or being a hater – we are simply challenging you to question a pervasive term that most likely runs counter to what many female entrepreneurs are trying to accomplish. I don’t disagree with you. I didn’t name the group. THIS. We don’t run around calling male CEO’s #maleboss or “boss studs”. It’s so ridiculous to me, and counteracts the movement to have women taken seriously as leaders in the workplace. Not attacking you Kath, I understand it’s just the name of a group you are part of, but it’s definitely something that needs to be talked about and taken out of our vernacular. 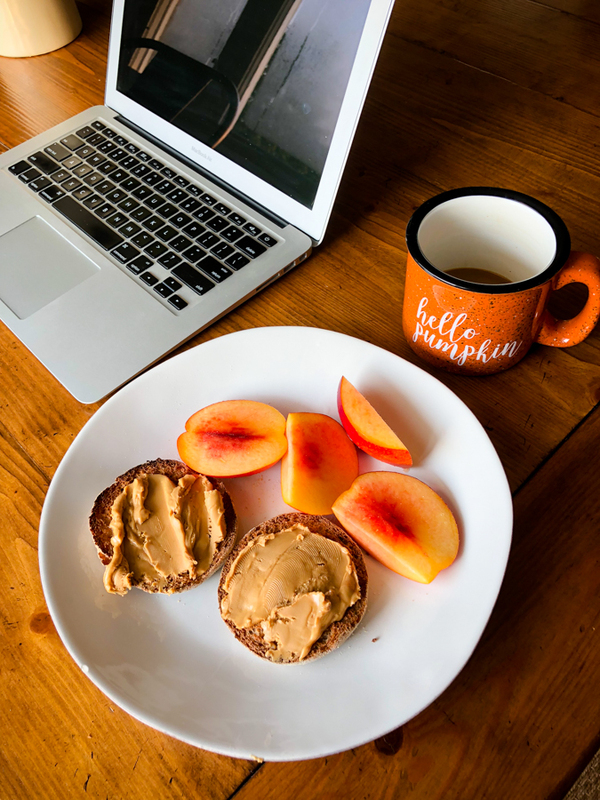 Love your breakfast – and especially the Hello Pumpkin Mug! Hello Autumn! I’m checking out the book recommendation you made now. Been after a new read all week. I’m sorry, but I just cringe every time someone says ” Boss Babe,” or “girl boss.” Why are we doing this to ourselves? To me, it’s like females are trying to empower other females, but by adding something to the word “boss”, I feel like we’re adding an inherent male gender to the word. Maybe it’s just me.. Cute coffee cup Kath. By the way, what kind of laptop are you using? I have an HP notebook but want to upgrade. Macbook Air – LOVE IT!! Once I went Mac, I’ll never go back. Thanks Kath. You always have good info. I will definitely check it out. I love Brooke Castillo’s podcast! Also good is the “Don’t Keep Your Day Job” one. I support every woman’s right to call herself whatever she wants, but I still think all the boss babe stuff is juvenile and regressive. I have owned a business for 17 years, and I take women less seriously when they use those terms- it sounds very try-hard, because it is a form of overcompensation. It has nothing to do with not supporting women, I would laugh to myself if a man called himself a “boss dude”, too, probably harder. 😉 Furthermore, being a feminist doesn’t mean *never* critiquing anything any woman does, that’s silly. I’m sure everyone will eventually grow out it, and feel confident and powerful as women, without needing to use a childish or sexualized word, but a lot of people are going to laugh or cringe, in the meantime, even if it’s in secret. Almost everything that’s not a formal recipe on here is iPhone 🙂 Recipes and client shoots are done with a Canon Mark II. Hi Kath, I LOVE this post! Thank you for sharing these great resources!